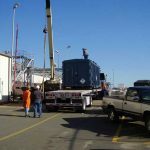 MRR was contracted by a refinery to decommission a 2000 gallon ethyl mercaptan tank and three adjoining truck loading racks. The entire process had to be completed without any nuisance leak calls. MRR proceeded to build movable shelters above each loading racks and through a proprietary process removed liquid from tanks and piping. The entire system was then depressurized and dismantled.